Reinforce sight words, sorting, writing a fact, and main idea and details with this fun and engaging emergent reader! 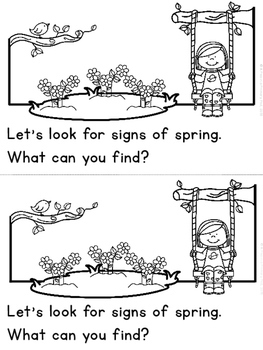 My "Signs of Spring" mini book practices the sight words look, at, the, I, see, a, and, her, up, down, over, here, there, what. 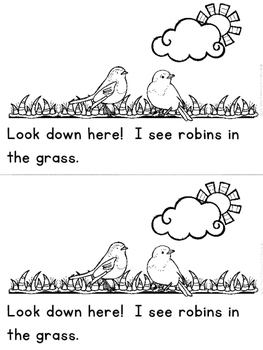 The story features semi-predictable text and follows a search for signs of spring. I have included three response activities. First, students will sort pictures according to whether or not they are a sign of spring. 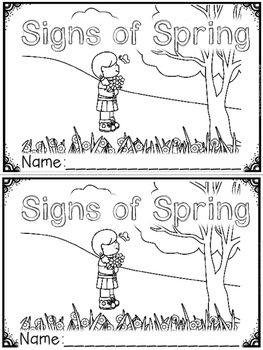 Second, students will draw a picture of another sign of spring, not included in the text, and write a matching sentence. 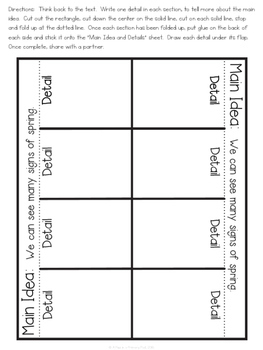 Last, students will complete a “match flip book” main idea and details graphic organizer. Given the main idea, students will draw and write details from the text. Detailed directions are included with this easy to complete activity! Once complete, students will be eager to share their creations. You can also attach each to colored construction paper and use as part of a "Signs of Spring" bulletin board or hallway display. Click on the green star to follow me for updates and freebies. Newly listed items are priced at 50% off, for the first 48 hours. Many spring themed activities are in the works! Looking for more spring themed emergent readers? Check out this growing bundle and save!